Barilla Pasta Sauce Variety Pack, 24 Ounce, 4 Jars Just $7.59! Ships FREE! 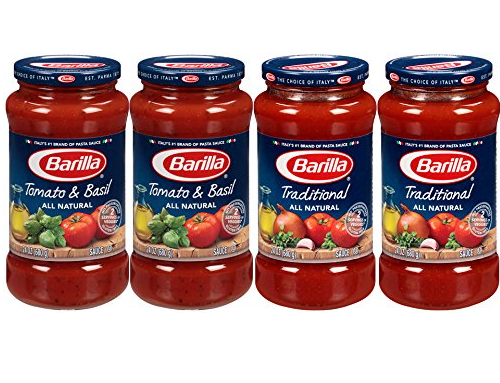 You are here: Home / Great Deals / Amazon Deals / Barilla Pasta Sauce Variety Pack, 24 Ounce, 4 Jars Just $7.59! Ships FREE! Head to Amazon to order Barilla Pasta Sauce Variety Pack, 24 Ounce, 4 Jars Just $7.59! Ships FREE on Subscribe and Save! That’s just $1.90 per jar! Both Walmart & Target currently have this sauce for over $2 a jar! Even better, when you subscribe to five or more items arriving in the same month, the price will drop another 10%! Thanks, Shop The Hot Deals!